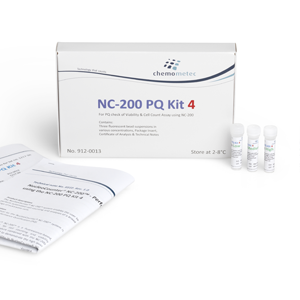 The PQ Test Kit 4 for the NucleoCounter® NC-200™ is specially designed to validate the functionality of the NucleoCounter® NC-200™ when using cassettes. Compared to the standard PQ Test Kit, PQ Test Kit 4 offers extended range of bead concentration and performance of viability. 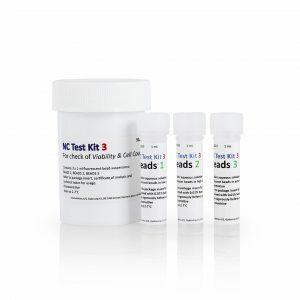 The PQ Test Kit 4 for NucleoCounter® NC-200™ consists of 3 bottles containing different concentrations of fluorescent beads with different blue/green ratios and a PQ test plan containing information about the tests to be performed on the instrument.